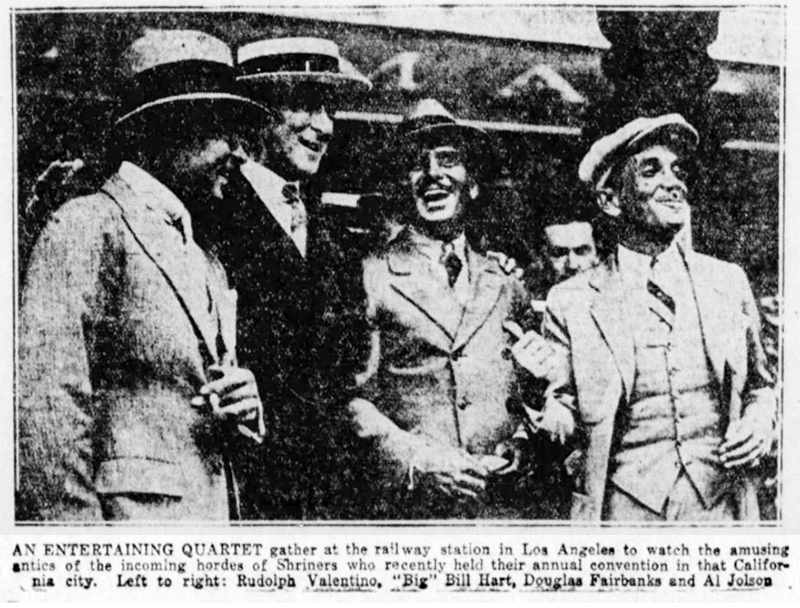 SCVHistory.com LW3287 | William S. Hart | Valentino, Hart, Fairbanks Greet Shriners Arriving for L.A. Convention, 1925. With a Pullman car as a backdrop, some of the biggest names in show business — (from left) Rudolph Valentino, William S. Hart, Douglas Fairbanks and Al Jolson (not pictured above) — are on hand to give arriving Shriners a big Hollywood welcome as they arrive in Los Angeles for their annual convention. 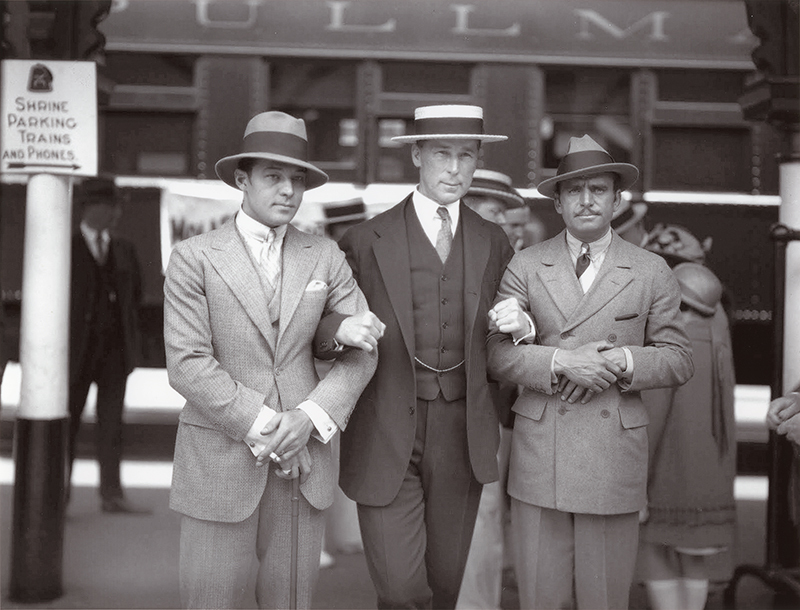 Valentino, Hart, Fairbanks, Jolson. Rochester (N.Y.) Democrat and Chronicle, June 28, 1925. Click to enlarge. This is late May or early June 1925; it might be June 2, which was designated "Hollywood Day," when 5,000 Shriners were to be taken by car from Los Angeles to Universal City so they could "see moving pictures in the making" (L.A. Times, May 17, 1925). In all, more than 100,000 Shriners descended on Los Angeles by plane, train and automobile (well, mostly by train) for the convention, which opened June 2, 1925, in the 2-year-old Los Angeles Memorial Coliseum (L.A. Times, June 3, 1925). The three transcontinental railroads provided more than 100 special trains to ferry Shriners to the City of Angels. "The Southern Pacific, Union Pacific and Santa Fe roads already are mobilizing a vast army of trainmen and hundreds of locomotives and passenger cars at strategic points between the Atlantic seaboard and Los Angeles," The Times reported May 8. "Relief engines are being stationed every 150 miles for the great railroad fleet of Shrine specials..." The first SP trains were set to arrive May 28, followed by the UP on the 30th and the Santa Fe on the 31st. LW3287: 9600 dpi jpeg from 8x10 copy print purchased 2018 by Leon Worden.